This is the fancy mix of any dried fruit lovers dream. 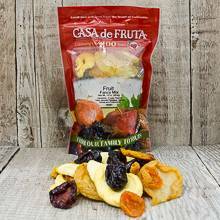 Our fancy fruit mix includes: fancy peaches, fancy jumbo pears, black French prunes, fancy apricots, and dried apple rings. Apart these dried fruits are delicious—together they’re an exquisite treat! Packaged in a 16 oz. bag.